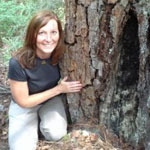 Dr Lori Daniels studied the effects of human disturbances and invasion of exotic species on biodiversity in the Richmond Nature Park, within the Lulu Island Bog in Richmond BC. The objectives were to quantify variation in plant diversity and to determine the effects of human disturbances and invasion of exotic species on biodiversity by comparing four different plant communities at six unique sites. At each site, the research team determined species composition and calculated four indices of biodiversity: richness, dominance, diversity and uncertainty. The study showed that biodiversity had been negatively affected by several anthropogenic activities over the past century. Direct disturbances such as the deposition of mineral-rich silt from the construction of the Massey Tunnel, creation of drainage ditches around the periphery of the park, and introduction of exotic species have altered soil nutrient availability, hydrological regimes, and other abiotic factors. The most extreme example of the impacts of invasion by an exotic species is the blueberry desert. Along the edges of the park, Birch-Western Hemlock-Sword Fern and Birch-Sword Fern forest communities dominate where disturbance to the soil has been most extensive. Although rich in species, these forest communities differ in composition from the less-disturbed treed bog communities in the interior of the Park. Biodiversity, indicated by high values of diversity and uncertainty and low dominance by individual species, was greatest in the treed bog forest north of the trails in the Park, followed by the restored treed bog forest near the centre of the Park. Although low in species richness, the species within the communities were relatively evenly distributed and included low abundances of exotic, invasive species. We conclude that the biodiversity measured at these sites is the best estimation of the level of biodiversity that once was present in the Greater Lulu Island Bog.